Jo Wilkinson is a former Great Britain marathon runner with 30 years experience of running road, track and XC. She is a fully qualified, licensed British Athletics coach. If your ambitions are to start running, run fitter, run further or run fast Jo's elite knowledge, love of running and bespoke coaching will challenge and inspire you to achieve your goals. From fully individually-tailored coaching plans, personal one-to-one or group coaching to running support and advice, Jo can help you. Jo Wilkinson is a fully qualified, licensed British Athletics Coach and Run Leader in Running Fitness. 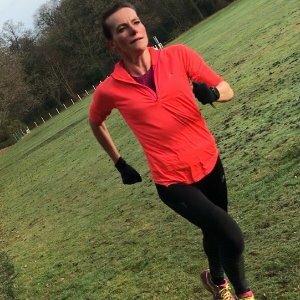 She currently coaches at Watford Harriers Athletics Club as well as running her own groups and personally coaching a number of athletes and runners from beginners to those seeking new inspiration and personal bests. She believes that anyone can run and everyone can love running. Jo enjoys coaching those who are starting running for the first time as much as those who already run but want to run further and run faster. She is experienced in offering ongoing coaching as well as coaching you towards a specific race. As a former elite athlete Jo knows how to train, target and peak for an event whether its 5k, 10k, half marathon or marathon. She can support those aiming for a specific time as well as those aiming to complete the event. Most importantly, Jo will ensure your training plan starts from where you are now and fits around your life to maximise your training. She has 30 years experience as an athlete and achieved a number of international honours. Most notably representing Great Britain in the marathon as part of the Bronze medal winning team at the European Championships in 2010. She has also finished in the top 20 at the London Marathon and the top 10 of the Great North Run. On the track her best performance was 6th in 10000ms Manchester Commonwealth Games in a new personal best. She has competed at national and international level at track, road, cross country. Success. Coach Jo Wilkinson has been notified of your message.